Japanese authorities are working to set the “tightest gaming regulations in the world” as part of the country’s casino legalisation efforts, said an official with Japan’s Cabinet. Naoya Haraikawa (pictured), Cabinet councillor, said the reason was that many Japanese regarded the casino sector as a “dangerous industry”, which is why the national government would take “full measures to deal with problem gambling”. Mr Haraikawa was speaking on Wednesday at the MGS Entertainment Show 2018 at Cotai Expo at the Venetian Macao. GGRAsia asked Mr Haraikawa on the sidelines of the event, if he anticipated the national government would have to introduce any new safeguards not already announced in public. “I don’t think so,” he told us. But a number of investment analysts have said the devil is in the detail when it comes to realising Japan casinos and the regulation attached to them. 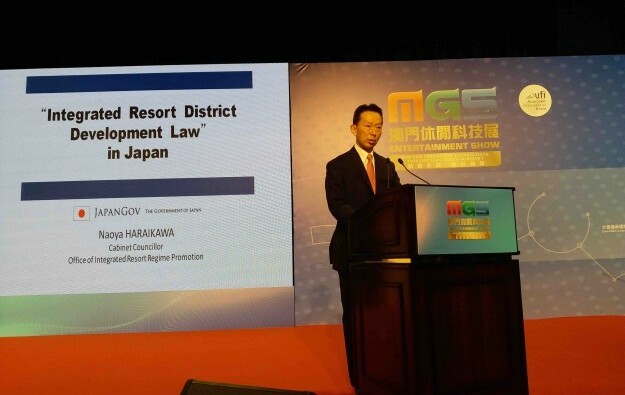 It has already been confirmed to GGRAsia by the governor of Wakayama prefecture that local governments will be able to introduce local regulations, designed to mitigate any negative effects on consumers regarding casino gaming. In the case of Wakayama – which proposes a waterside site that would also double as a holiday resort – one proposal was that casino users should not be allowed to enter wearing shorts or sandals, the idea being to prevent impulse gambling from those coming in after pursuing other leisure activities. Cabinet official Mr Haraikawa reiterated that the national government harm mitigation measures included a limit on the number of casino visits permitted per month for Japanese citizens and non-citizen residents of the country. A statute legalising the concept of Japanese casino gaming venues – the IR Promotion Bill – came into effect in December 2016. The second enabling bill – the IR Implementation Bill, approved in July – clarified several key points regarding the country’s nascent industry including: an initial cap of three casino resorts nationwide; a 30 percent tax on casino gross gaming revenue; and an entry levy of JPY6,000 (US$53) for Japanese citizens and residents wishing to enter such venues. The official further clarified that the 30 percent tax on gross gaming revenue would be equally shared between the national government and the local governments that host such resorts. Mr Haraikawa also said he estimated the first resort could be opened in 2025, although he said the timetable would be tight. In a follow-up panel after the Cabinet official’s presentation, a consultant from business services firm EY, said it was more likely to be 2027 before an inaugural resort could be launched. The year “2023 would be a key milestone” in terms of the Japanese government deciding locations, said Masayo Watanabe, senior manager, integrated resort office support office, for EY based in Tokyo. “It will take four years” for entities in Japan to build such resorts, EY estimates, meaning it would be “2027 before the opening”, Ms Watanabe added.